The North Island is a wonderland of history, culture and myth. From ancient Maori legends to the beginnings of European settlement, there are a host of intriguing stories to unearth during your time here. The vibrant city of Auckland bids you kia ora. Spend time sailing its beautiful harbour, walking the black sand beaches of the west coast or taking in the sights on a city tour, before travelling towards the Bay of Islands. Here you’ll find Tane Mahuta, a 2,000-year-old kauri tree, and enjoy the sweeping sunset over Hokianga Bay. Visit the significant Waitangi Treaty Grounds before heading to Rotorua. Known for bubbling mud pools, shooting geysers and natural hot springs, it also showcases captivating M-aori culture. The magnificent Art Deco town of Napier awaits before you end your journey in the national capital Wellington. 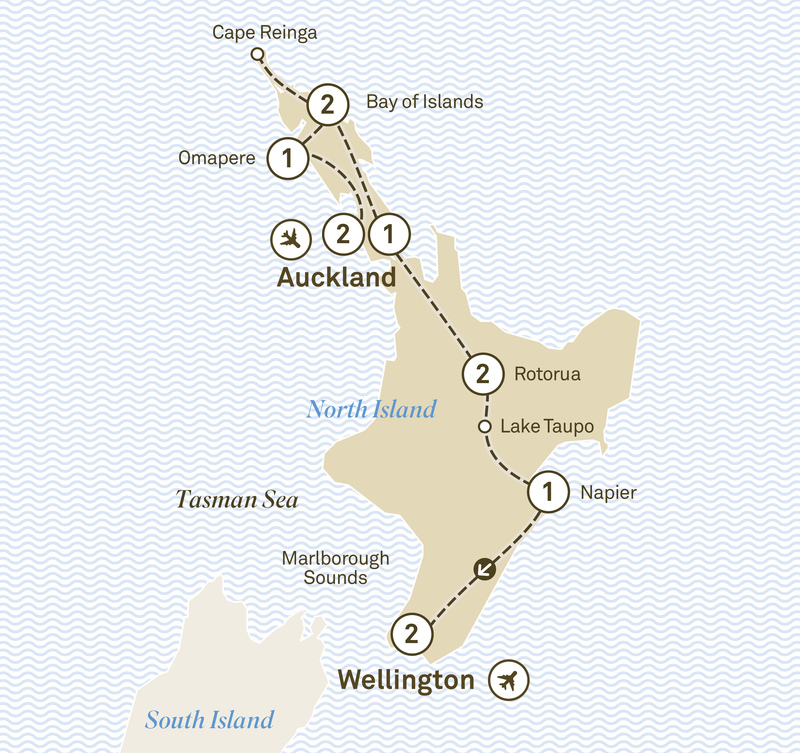 You’ll leave no stone unturned during this quest for the essence of the North Island.